In this post, we are going to do a brief Q and A to review what enzymes do and how they work. This post will be slightly beyond a basic introduction so it is probably most appropriate for a student who already has a sense of what enzymes are. You may already know that enzymes function as biological catalysts to speed up reactions. But what exactly does that mean? To start answering that question, lets diagram a reaction. Below you will see a reaction coordinate diagram of a generic reaction. The red line shows you how the reaction would move forward in the absence of an enzyme. As you can probably intuit, for the reaction to move forward the reactants must have enough energy to overcome the big red hill of energy in the middle of the graph. The peak of this hill is what we call the transition state, or the highest energy configuration somewhere between the reactants and products. The difference between the energy level of the reactants and the transition state is referred to as the activation energy. Okay, so what does all of this have to do with enzymes? 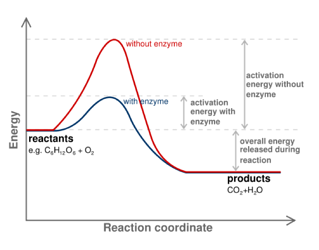 Well enzymes speed up reactions by decreasing this activation energy (as you can see in the diagram represented by the blue line). Please note that the presence of an enzyme does not, however, change the difference in energy between reactants and products, only the activation energy. You probably know that an enzyme works when a substrate enters its active site to form an enzyme substrate complex? But how does this complex form to catalyze a reaction? This model is no longer well accepted. It states that every active site fits one kind of substrate (like each lock will accept only one key) and that enzymatic change occurs only after the substrate binds to the active site. This model makes intuitive sense but it does not explain promiscuous reactivity (the finding that an enzyme can catalyze more than one reaction on more than one kind of substrate) among other phenomenon. This model states that once the active site comes into contact with the substrate, it molds itself around the substrate creating a more exact fit. Unlike the lock and key model, this model suggests that conformational changes occur during binding, catalysis, and release. 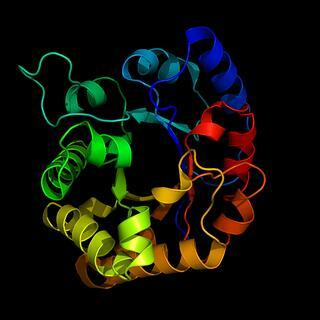 This theory has been confirmed using x-ray crystallography and is consistent with other findings about enzyme behavior. What is it about an enzyme that allows it to stabilize and lower the energy of the transition state (and thus make the reaction move forward more rapidly)? Enzymes can do other things including excluding water from the active site or covalently bonding with the transition state to stabilize it. Enzymes can also increase the rate of reaction using orientation or proximity. This is not an exhaustive list, but it should give you a sense of how enzymes function to lower activation energy. I hope this more in depth review helped you take your enzyme knowledge to the next level! Happy studying! Are you interested in connecting with a biology tutor in Boston, New York, or online? What is the phospholipid bilayer and what determines its fluidity? An Introduction to Blood Types: Genotype, Phenotype, Inheritance, Transfusion, and More!